The J-Rack is designed to carry a single kayak securely on the roof of your vehicle. The universal design allows for use with most kayaks on the market today and can be installed on factory or after-market square crossbars (not recommended for use on round crossbars). Each rack is constructed of high quality steel and features soft foam padding to prevent scuffing on kayaks. 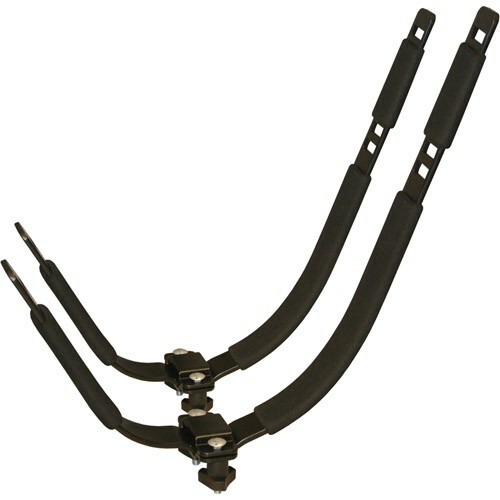 Includes two 114" straps specifically designed for use with the J-Rack Kayak Carrier. Dimensions: 16-3/4" L x 1-3/4" W x 15-1/4" H. Mounting requirements: Max. Square Cross Bar: 1-3/4" W x 1-1/2" H, Min. Cross Bars: 1/4″ W x 1/2″ H. Not recommended for round cross bars.